On Thursday and Friday about 120 people gathered in Chicago for the 31st Tutor/Mentor Leadership and Networking Conference. Some were here for their second, third or fourth conference, such as Darryl Finch, from Milwaukee (shown in picture with myself). Others, like a group of six faith leaders from Mississippi, were here for the first time. On various blogs, and in the Tutor/Mentor Connection on Ning, and the NUTutormentor on Ning, we'll try to summarize some of what happened, and attempt to connect all of these people, and others, so that over the next six months we can do more to help tutor/mentor programs grow and expand the social capital and learning opportunities for youth in high poverty areas of Chicago, and other cities. Part of the learning is to share ideas. The number of people who can attend our conference in Chicago is really small, compared the the millions of people who need to find and use the information we share. On the Tutor/Mentor Connection web site I've a library of more than 1500 links to information that any one in Chicago, or any other state, can use to support their own efforts. Common Good Forecaster - this site is really useful to illustrate how a better education improves the outcomes for youth and communities. No mater what state you live in, you can use this site. While these are a few cool technology tools, another section you should bookmark is one titled Process Improvement and Collaboration. The links in this section are sites that anyone can use to build more effective collaborations, smarter organizations, and more effective strategies to help kids in poverty get the network of support they need to move from first grade to careers. I hope you find this information useful. 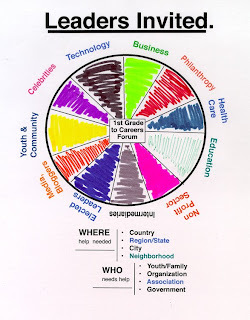 If you attended the conference in Chicago I hope to connect with you on-line as we work to build the resources needed to sustain existing non profits working with kids, and to help new ones grow where they are needed. This is a huge mountain to climb and no single individual or organization can do all that is needed. I look forward to connecting with those who want our help, or who can help us. Conference Tomorrow! 31st Since 1994. Tomorrow we'll be hosting the Tutor/Mentor Leadership and Networking Conference, at Northwestern University School of Law in Chicago. This will be the 16th year we've hosted these conferences. They bring together leaders of tutor/mentor programs in Chicago and other cities, along with people who are interested in starting new programs, or who are involved from a research, public education, philanthropy, or business perspective. You can read what Chris Warren and Nicole White have to say about the conference on their blogs (both work for me at Cabrini Connections, Tutor/Mentor Connection). I keep connecting with former students and volunteers from past years. Many tell me how much they appreciated being part of the program. Some of the volunteers boast, just like parents, at how well their students are now doing. However, many also show how much they still need help. That's why I keep doing this. It has meant something to hundreds of youth and adults, and it has created connections between rich and poor that would not exist if we had not enabled the connection by hosting the program. It's still needed. That's why we need help. You can read what El Da'Sheon Nix wrote about the funding challenge, on his blog. However, we're not the only program that needs help, or is doing good work. The purpose of the conference, and the Tutor/Mentor Connection, is to raise visibility for all programs in the city, to help each program get ideas that help them keep long term connections with kids and adults. More than that, there are neighborhoods without any tutor/mentor programs. I received an email from the ED of another program this week, asking if I could help find a mentor for a 12 year old girl living near 63rd and Kedzie. There are few programs in that part of the city, meaning while the parent is looking for help, nothing will be there until community members, faith leaders, businesses and elected leaders provide the time, talent and dollars, to launch a program to serve that area. By hosting the conference we help our own program, and we help others build programs in every neighborhoods. If you think this if valuable, why not help us by becoming a sponsor, or donor? So what is he talking about? And as tourist come to the barber shop over the next 4 to 8 years, what will they talk about? Come to the Tutor/Mentor Leadership and Networking Conference this Thursday, and find out how the Hyde Park Hair Salon seeks to become a hub for community activism. At 12:50pm on Thursday, the keynote presentation will be titled: CCommunity Organizing Opportunities in the Neighborhood Barbershop. The speaker will be Ishmael Alamin, Owner of the Hyde Park Hair Salon, the Official Barbershop of President Barack Obama, located in Hyde Park, Ill. Assisted by Kenya Robinson, Marketing Director for Hyde Park Hair Salon. Hyde Park is a business that has been in the Hyde park community for over 80 years. We have seen, heard and spoken with many people of the community and around the city about numerous subjects. The barbershop has always been a place where people conversate and find out what exactly is going on in communities, politics, current events, sports, family and around the world. The barbershop has a history of community organization, used as a measurement of political views, shaping of opinions etc. ...in short, a place to hear and tell it all. This idea holds true rather it is a minority shop or not. This is an ideal place to speak with people from all over the community and introduce the different ways in which we can help the community. The same ideas and concerns shared in the shop should not end with conversation. Many people do not know how or what to do about many problems discussed while others don't believe there is anything that can be done about certain issues and problems. In introducing them to the Tutor/Mentor Connection, discussing tutoring and/or mentoring programs, and the RESULTS of programs that have been implemented and have actually worked. Not only should barbershops be used as a forum to express problems but as a forum to solve them or receive the tools to help. Read this pdf to learn more about the Hyde Park Hair Salon. Best Memorial. Get involved and stay involved. I posted this message on my blog at Fox Chicago TV, and would like to post it in hundreds of other places. Maybe you can help me, by passing this message on. As we head into this holiday weekend, there will be thousands of parades, speeches, blogs and other services giving recognition to the men and women who have sacrificed their lives and bodies for the freedom we enjoy. As a veteran, who was lucky enough to go through my three years in the Army with nothing more than a few hangovers, I appreciate these memorials. However, as a commander, in the War against Poverty, I want to add my own message. I've spent 35 years leading a volunteer based tutor/mentor program in Chicago, connecting inner city youth with workplace volunteers. I've given much of my time, talent, income, savings, and family life, to this cause. I've spent weekends, evenings, lunch hours, Sunday mornings, holidays, and other precious moments, trying to find ways to make tutoring/mentoring programs have a greater impact on the kids and volunteers in my own programs, and in other areas of the Chicago region where kids need these programs. Thus as I've written my blog articles each Memorial Day and Labor Day and Veterans Day for the past few years, my message has been the same. 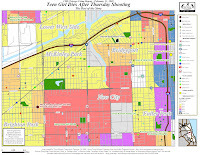 How much are people who don't live in poverty, or who lead businesses, faith groups, political organizations and/or media willing to sacrifice, every day of the year, to make sure kids living in high poverty neighborhoods have an expanded network of support that a tutor/mentor program like Cabrini Connections, or like others you can see in our Program Locator database. Many of the men and women coming back from service overseas will be coming back to the neighborhoods where tutor/mentor programs are needed. Not having enough supports for their children, siblings, and neighborhoods is just one more problem that our veterans will face. We must do better than this and it won't happen without consistent sacrifice and service for many years and in many places. Most of the men and women in service have learned to use maps to understand where the enemy is located, and to plan the distribution of troops, supplies, etc. We want to teach leaders in this War on Poverty to use maps, the same way generals do. If you agree and want to get involved, come to the Tutor/Mentor Leadership and Networking Conference next Thursday and Friday, May 28 and 29, in Chicago. Or reach out to a tutor/mentor program with a donation to help them do their work. May 19, 2009: Two new briefings from Child Trends cite mentoring as a strategy in preparing young people to make a successful transition into adulthood and in preparing young people to succeed in the workplace. Both briefings are from the larger report titled A Developmental Perspective on College and Workplace Readiness by Laura Lippman, Astrid Atienza, Andrew Rivers and Julie Keith. The report received support from the Bill and Melinda Gates Foundation and draws on research across the fields of college readiness, workplace readiness and youth development to identify the skills and competencies high school students need to master for future success. To become successful adults, one brief identifies strategies that high schools can use to foster skills not covered in the curriculum — skills such as problem-solving and a strong work ethic. In working with special populations of children, mentoring appears as a particularly effective way to help low-income and minority youth: "Mentoring programs may increase academic motivation and school attendance and reduce problem behavior … as well as encourage students to consider post secondary educational opportunities." In the briefing on how high schools can help students develop skills to succeed in the workplace, mentoring is an option that increases support for young people: "Pair students with mentors to help develop interpersonal skills and identify career interests and opportunities. Mentors can help foster leadership, communication and social skills." For the full report, go to Child Trends, and to download the briefings, go to www.mentoring.org/news/120. If you accept this information as fact, then the next question is "What can business, philanthropy and government do to assure that comprehensive, volunteer-based tutor/mentor programs are reaching kids in neighborhoods where they need this help?" Read the articles in the Tutor/Mentor Institute as you brainstorm the answers to this question, then apply this thinking through your own business, college, faith group, to support programs offering these services in Chicago and other cities. Use the Program Locator to find contact information for more than 170 tutoring and/or mentoring programs in Chicago, including Cabrini Connections, which is the program we operate. Here's an article in the Washington Post that I encourage you to read and pass on. If you read our logic model, then you'll see that if you believe in the power of volunteering, then creating more places where volunteers can connect with kids would be a strategy for helping more people engage in service. Come to the conference on May 28 and 29 and learn ways to support the growth of volunteer-based tutor/mentor programs. I found three stories this weekend that I encourage you to read. One is the perspectives story titled "Too Young to Die" in the Chicago Tribune, where a full page was devoted to images of tragic deaths of inner city kids, from Chicago and other cities. Another was today's column by Dawn Turner Trice, quoting Phil Jackson, of the Black Star Project, and telling how people need to do something to stop these tragedies. The third was in Crain's Chicago Business, where Greg Hinz wrote an article called "Left Behind" focusing on the same problems as the first two articles. After a bit of outrage, what will readers do next? Who will visit the Black Star Project to learn more about what Phil Jackson has to say? Who will visit this blog, to read what I have to say? Who will visit web sites of tutor/mentor programs, like Cabrini Connections, and see what our youth have to say? Who will use the Tutor/Mentor Program Locator to find out where tutor/mentor programs are located, and which one they can help with a donations this week, or this month, so they are able to keep trying to help kids make better decisions so they overcome the challenges that these three articles point out. None of these media stories pointed to this blog, or our maps. I don't find anything on the Black Star Project web site pointing out that there are other tutor/mentor programs in the Chicago area who also working with inner city kids, and who also need donations and volunteers. Until we get people thinking of all the places where kids need help, and of how to support all of the different organizations working to help kids, some programs will be supported for some of the time, but few will be fully supported for all the years it takes to solve these problems, or just to help one youth go from first grade, through high school, through college or vocational school, and into a job. We'll focus on this type of collaboration at the May 28 and 29 Tutor/Mentor Conference being held at Northwestern University School of Law. If you care about these issues, encourage people you know to attend. This message was delivered in testimony before Congress this week. Read more. If we want to keep teens in school, we need to build non school support systems, like Cabrini Connections, and have them available for many years, and in every neighborhood with high poverty. They need to reach kids starting in elementary schools, and connected with age appropriate learning and mentoring throughout high school. Read the new P/PV study on the Boys and Girls Clubs, which illustrates the importance of "places" where youth are supported for multiple years. We need incentives that encourage businesses to invest employee time, talent and dollars as resources in strategies that PULL kids from many different neighborhoods, up pipelines that lead to jobs and careers. We need thousands of non-school places where staff, volunteers are PUSHING kids to stay in school, make healthy decisions, and move to 21st century jobs and careers. The best stimulus would be $25,000 to $50,000 in donations going this month, JUNE, and JULY, to keep people on payroll in these programs, and keep them operating, so kids and volunteers now finishing the 2008-09 school year are still connected when the 2009-10 school year starts. 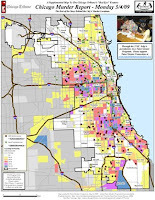 Without using maps, like this one, to see where poverty, poor schools, and high drop out rates are most concentrated, leaders, and generals (like the President), won't distribute resources consistently into all the neighborhoods, and all the places (tutor/mentor programs included) where these dollars, and volunteer talent, are needed. Mr. President, and others who care about the drop out crisis, I urge you to browse the articles on this blog, and look at the maps at our mapping blog. Use these, and the links on our web sites, to educate the American people, so that volunteer service is more than random acts of kindness or responses to personal or environmental disasters. Educate the public to make a long-term commitment, in many places, to provide the type of supports that keep kids in school and headed to careers. What you invest will be less than the costs to America of not taking this role. 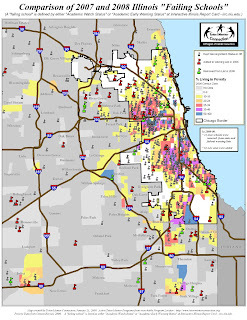 Then use the new interactive program locator to build resource distribution strategies from businesses, faith groups, political districts and colleges/hospitals, directly to volunteer-based tutor/mentor programs operating in different parts of the Chicago region. In some cases there are no programs. In some cases the programs may not be as good as they need to be. However, your challenge, Mr. President, and Mr. Business leader, is to help each program grow to be great, as Jim Collins suggests in his book "Good to Great and the Social Sectors", and as business leaders know, from building their own companies. Here's a strategy map you might borrow for your own leadership. Just replace the blue box saying "tutor/mentor connection" with your own company or leadership name. 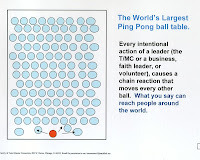 See if the actions mapped don't make sense for you as a leader. If they do, use them. We'll benefit at Cabrini Connections. So will thousands of other youth all over the country. Creating Understanding. Sharing it with others. 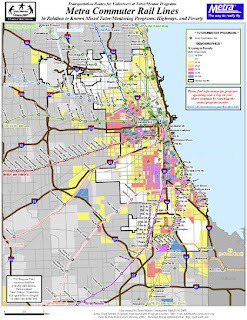 Chris Warren, our 2008-09 Public Interest Fellow from Northwestern has written two articles that provide information you can use to better understand Cabrini Connections, Tutor/Mentor Connection. This article was intended to shed new light on the Tutor/Mentor Connection. In this distressed economy it is critically important that other people pass on Chris' articles to people in their own network who can make small, and large, financial contributions to help us do the work Chris writes about, and to help us fund the 2009-10 fellow, which will cost us about $25,000. Without the help of donors it's not possible for us to do the work we're doing. We, the people in Illinois, must be leaders. I attended an event at the State Capital in Springfield, Illinois on Monday, focused on Civic Engagement of Older Adults. This was sponsored by the Illinois Policy Academy of the National Governor's Association. 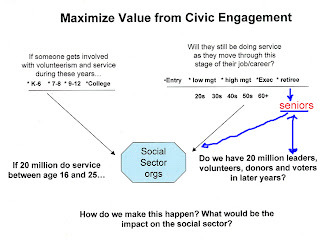 I created the graphic a year ago following the National Conference on Volunteering and Service. I've written several articles about how to engage volunteers more strategically in long-term service and complex problem solving. Thus, I was excited to participate in this event. One of the main organizers, was Jane Angelis, who I've known since 1994. She attended the first Tutor/Mentor Conference, and was one of the people who encouraged the publication of our tutor/mentor directory, which is now the on-line Program Locator. Jane has led the Intergenerational Initiative for as long as I've led the Tutor/Mentor Connection. It was in spring 1995, at a meeting she hosted, that the August/September Tutor/Mentor Volunteer Recruitment Campaign idea was given birth. There were many good speakers, and great ideas shared at this event. I plan to add links to some on the Tutor/Mentor Connection library. John concluded by saying "Why do I care so much about good citizens?" He answered by saying "We face many challenges. Who will take them on and say 'I will do everything in my power'? We cannot afford to leave a talented segment of society on the sidelines." If you read some of the articles I've written for the past few years, such as this one, you'll see that John and I are on the same page. There were others with great ideas to share. For instance, Bob Gallow, state director for AARP, introduced Create the Good, which seeks to point AARP members to volunteer and service opportunities. Scot Nierman and others from the Serve Illinois Commission, were their to share information about the State's Volunteer Inquiry portal. Others shared information about the Illinois Worknet portal, which offers information for business and workers in the state. One of the most unique programs was the Retirees Leading Initiative of Spoon River College. I liked this because it shows the university taking an active role in helping retirees learn leadership roles they could take in the community. I'd like to have this type of support for the Tutor/Mentor Connection. Monday's meeting was part of a process, intended to develop public policy that engages the time and talent of older Americans in volunteer and community service, and/or in second careers. I hope that as such groups move forward, they will use the ideas of the Tutor/Mentor Connection. We need adults of all ages, backgrounds, races, economic sectors working, and sacrificing, if we're to create a future that has more hope and opportunity for all Americans than the present offers. I hope some of these groups will join with the Tutor/Mentor Connection in on-line forums, and at the May 28 and 29 Tutor/Mentor Leadership and Networking Conference. A couple of weeks ago I wrote an article about how non profits need to recruit talent from more places to help them be effective in their work. Gayle C. Thorsen wrote an article about non profit story telling which provides some good advise, but also illustrates how non profits would benefit if others were lending their talent to help them tell their story, build technology strategies, or do more effective tutoring and/or mentoring. If you're in a journalism school, writing class at the local high school, or in some other program where you're learning to write and communicate, I urge you to consider adopting one or more tutor/mentor programs as the subject matter. If you apply the ideas of Ms. Thorsen you can help the program you adopt be more successful in the work they're trying to do. Come to the Tutor/Mentor Leadership and Networking Conference in Chicago on May 28 and 29 and share your strategies, experiences and ideas with others. Most of the articles on this blog focus on what people need to do to help make volunteer-based tutor/mentor programs more available to inner city kids. At this point, there are too few programs in most places (see maps here, and here, to judge for yourself) and there are too few donors providing consistent, flexible, operating dollars needed at each tutor/mentor program location. My belief is that the only way that will change is if the program strategy aims to transform the volunteer, not just the youth. In fact, I believe that unless we do not change what the adults do, and how much they are willing to sacrifice, we'll never have enough resources to do everything that is needed to offset the negatives of poverty, racism, violence, and all sorts of other issues that make growing up in urban poverty a much different challenge than growing up any where else in the USA. Thus, Cabrini Connections has always sought to empower its volunteers to be leaders. As a result, we have volunteers who have been connected to us for more than 30 years, who still tutor, make donations, serve on boards, or help organize activities. Today I want to point to Rebecca Parrish, who joined us as a volunteer about 4 years ago. She took over the lead of a video project which had been started a year earlier by other volunteers. This project was completed this spring, and copies can now be purchased on eBey. What I want to praise about Rebecca, is how she is using her web site to share with others the work she does with us, and with other non profits. Click here to see a video about the Tutor/Mentor Connection. Click here to see information about the RawVoices award. 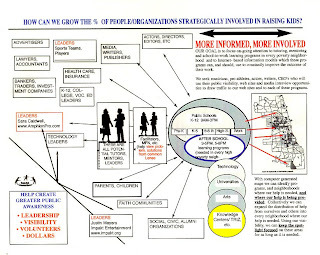 This graphic is one of many you can find on this blog showing complex problems, leadership, and actions that can lead to more and better tutor/mentor programs helping kids through school and into careers. Without volunteers who are part of Cabrini Connections, or part of other volunteer based tutor/mentor programs, in Chicago, and in other cities, taking on the network-building role that we describe in this graphic, we'll never increase the pool of donors, or change the way funding is provided through competitive grants, or tops down restrictions. However, as more and more of our youth, alumni and volunteers take the time to tell the story of where and why they are involved, more of the people they know will begin to provide their own time, talent, and dollars, to help. NFL Star says "I wish I had a program like this when I was growing up." 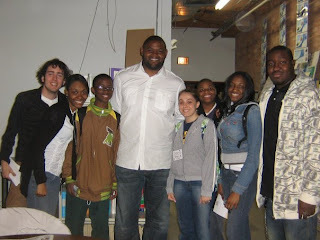 Cabrini Connections was visited by Orlando Pace, new Chicago Bear and future NFL Hall of Fame football player. He talked about discipline, sacrifice, and hard work needed to achieve any dream. He also said he wished he had a program like Cabrini Connections when he was growing up. We want to keep Cabrini Connections available to our teens, and we want to help programs like this grow in all poverty areas of Chicago, Sandusky, and other cities. That's why we need you to donate a few dollars today so we have the money to keep doing this work. Here's a blog article that expresses some of my frustration, along with some of my hopes. The 2009 Cabrini Connections' graduating class consist of Dominique Dobbs, LaFaye Garth, Angelene Hemphill, Eboni Rivera, and Charles Thomas, and they all have different plans as they continue on their path to a career by the age of 25. Your donations can help us keep this program in place for the 2009-10 school year. Technology Woes. A Chicago without a Tutor/Mentor Connection? If you've been trying to log into the www.tutormentorconnection.org web site this week, we've had some problems with a change in DNS listings. We're working to get it fixed. If you have found the information we collect and share to be valuable, can you imagine a Chicago without the Tutor/Mentor Connection? Almost 10 years ago a research at Chapin Hall produced a brief case study of the Tutor/Mentor Connection (T/MC). In that report they recognized that we were operating with too few resources, but that it was difficult to communicate what the T/MC is because "Infrastructures are Difficult to Understand". The Chapin Hall report states "T/MC may be particularly difficult to understand because it does not easily fit within known categories of organizations. It provides some of the supports that a membership organization or association would -- such as its newsletter, conference, and public relations efforts-- but it doesn't charge a membership fee or offer a membership identity. It also provides some of the matching services that volunteer associations provide and some of the technical assistance provided by organizations that do training and management consulting but without the fee sometimes charged by such consultants. Moreover, T/MC's citywide mission to not only support programs, but to increase their numbers, sets it apart from other types of programs." In the concluding discussion about providing an understanding of T/MC's effect, the Chapin Hall report suggest "Other ways to relate the importance of T/MC's work might include strategies that would somehow show a Chicago without T/MC in order to demonstrate what would be lost without them." Do you want a Chicago without a Tutor/Mentor Connection? We don't want that to happen, which is why we're trying to expand the number of people who make small and large donations to fund our operations through this economic troubled times. If you value what we're doing, please make a donation, and help us find benefactors who would not only help us continue our current level of service, but help us continue to innovate new ways to help tutor/mentor programs grow and operate in every high poverty neighborhood of Chicago, and in other cities. Tracking Murders in Chicago. How about tracking tutor/mentor programs, too? Today's front page for the ChicagoSunTimes featured the story of a boy brutally murdered on the Southwest Side of Chicago. Page 2 was also devoted to this story. The front cover of Chicago's RedEye newspaper, featured the headline "Chicago Murder Report". Two inside pages gave the grim details and provide a map showing where these took place. However, neither of these stories, which represent more than $500,000 worth of news space (from an advertising perspective) did anything to show how readers might do something, such as support volunteer-based tutor/mentor programs in the neighborhoods where there are too many shootings caused by too much poverty. 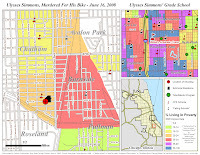 Take a look at the crime mapping that the Tutor/Mentor Connection is doing. We not only show where the bad news took place, but also show steps that community leaders, elected officials, faith and business leaders, and individual citizens, can do to help volunteer-based tutor/mentor programs reach kids in these neighborhoods. I hope that the disgusting details of today's killing, or the staggering number of killings and shootings reported in REDEYE, cause many readers in the city and suburbs to ask "WHAT CAN I DO?" Right now you can look look at the Tutor/Mentor Program Locator database and pick one or more programs, such as Cabrini Connections, then send a donation. A big one if you can. A small one if that's what your budget allows. Government funding for prevention is being reduced, while dollars from donors are shrinking due to the depression. This means that unless more people respond to negative news with positive actions, there will be fewer tutor/mentor programs trying to reach kids than there are now. And right now, there are too few! If you browse the tags on the left side of this blog, you can read more of the articles about ways leaders can help volunteer-based tutor/mentor programs reach more kids in Chicago neighborhoods. You can also find information about the Tutor/Mentor Conference on May 28 and 29 where one panel will include media members who will talk about how they cover the negative news. The conference, and the Tutor/Mentor Connection are made possible by donations from individuals, corporations and foundations, not the government. Without your continued help, we cannot keep trying to turn the violence off, by turning kids on to other aspirations and opportunities. Good tutor/mentor programs are needed. Without your help, many won't survive and new ones will not grow in places where more are needed. "successful organizations "create ways for many people to engage with their organization"
The book "Forces for Good: The 6 Practices of High-Impact Nonprofits" argues that successful organizations "create ways for many people to engage with their organization...and convert them into evangelists who will spread the word among their social networks." Chris Warren's article on social networking shows how important it is for volunteers, students and others who know Cabrini Connections, or the Tutor/Mentor Connection, to reach out to invite people in their own networks to get involved. Mike Trakan shows how the media can take an expanded role in drawing volunteers and donors to neighborhoods they focus on in "negative news" stories. El Da'Sheon Nix shows how he is reaching out to his network of former college and pro football players to enlist their support for tutoring/mentoring. Nicole White is using her blog articles, to draw attention to other tutor/mentor programs in Chicago, showing how members of a network can support each other. The May 28 and 29 Tutor/Mentor Leadership and Networking Conference, and our Ning on-line forum are places where any member of this constantly expanding network can meet to share ideas, learn, and expand their own network. My role as leader of Cabrini Connections, Tutor/Mentor Connection, is to do anything I can to help other people take on their own roles as leaders and network builders in support of tutor/mentor programs in Chicago and beyond. If I'm willing to stand on my head to do this, what level of commitment can we enlist from thousands of others. Raising kids is a 20 year process. Mentoring kids through school to jobs is a 10 to 15 year process. We need to ask for dollars every day since the kids and families don't have the money to pay for this process. That means we need the help of many, many people, if we're to reach the number of potential donors we need to reach, and if we're to simulate a commitment to give that provides the dollars we and other tutor/mentor programs need to operate.